I was just reviewing the 380th website and I thought I would send this poor photo to you. My father, Fred Carlage, was a flight navigator in the 529 squadron. The plane pictured may be the Miss Hap. Pilot Ivey, Co-Pilot Hansen, Navigator Carlage, Bombardier Smith. Engineer Imondi, Asst. Engr. South, Radio man Ellingson, Gunner Ahern, Gunner Pickens, Tail Gunner Brusso. This picture was taken at the Pueblo Air Force base. I have my father's war album which has approx 150-200 pictures. I snapped this photo with a digital camera and I can't get the glare out. My father is still living at 95 and he believes he is the last survivor of the Ivey crew. We had our Anzac Day earlier this week on the 25th. I had a spare Poppy so I placed it on the 380th Bomb Group plaque in the gardens at the Adelaide River War Cemetery. Thanks to all those brave Americans who gave their all from Australian soil. My grandfather just passed away on Tuesday. I have been thinking about him a lot. I am only 25, so not that old, but I remember when I was a kid he used to tell stories about the war all the time. In recent years he has not talked about it as much just because he became more quiet as he got older, I think it's common for people to get more quiet as they age. So I never really got a chance to talk to him about the war recently. I knew a lot about what he went through and some of the missions he was in. But I was not sure exactly what air force he served in, never mind the bomb group and squadron number. His name is George Leaska, he was a tail gunner in a B-24. By searching the internet I found your website and found out that he served in the 5th Air Force, 380th bomb group, 530th squadron, in air crew #64. Barnett was the flight commander, I have heard him mention the name Barnett before. Some of the other names sound familiar too. Since my grandfather just passed away I am still very emotional about it. But websites like this help me feel like I can reconnect with him. I just want to thank you for preserving the history of what my grandfather and all the other veterans went through. Preserving this history and allowing their legacy live on is extremely important to me. In the coming days I will spend time looking through your website. 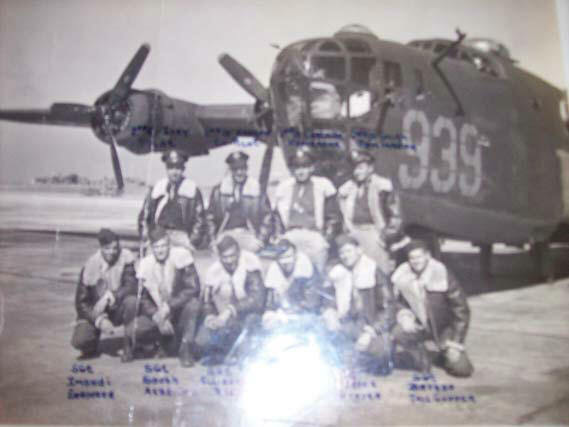 I hope that I can find a picture of my grandfather's flight crew, with him in the picture. 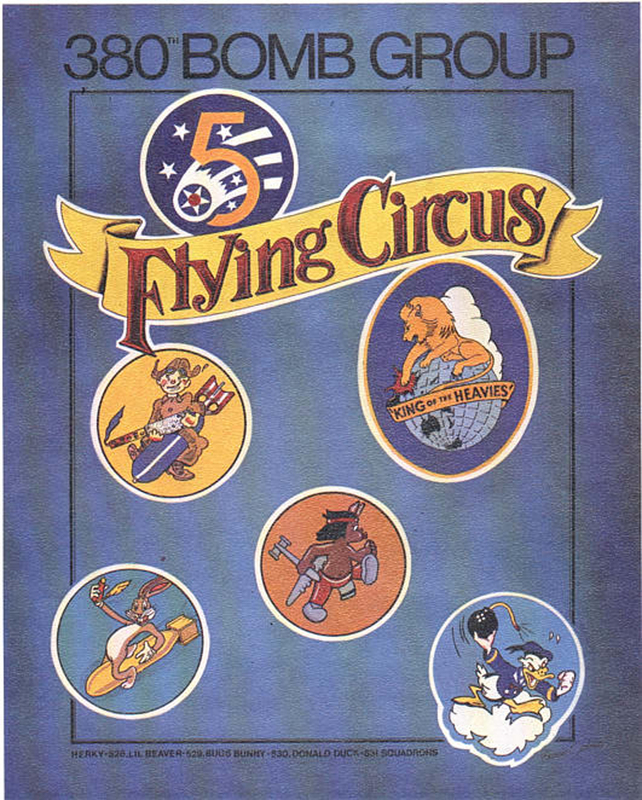 I'm not sure if anybody else from air crew #64 is still alive. I think my grandfather may have been the last surviving member because I know he was the youngest person in the crew, he was only 17 when he enlisted in 1943. I finally got a photo of the very Spitfire that had the head-on crash with Queer Dear/Deer on 18th September 1944; its serial number was A58-435 with Rego QY-T, Arthur Kelly's nephew in Adelaide mailed it to me along with some letters dated 1993 to his nephew Keith from another Pilot named Ron Cundy; he had the Spitfire before A.K. Kelly took it over. 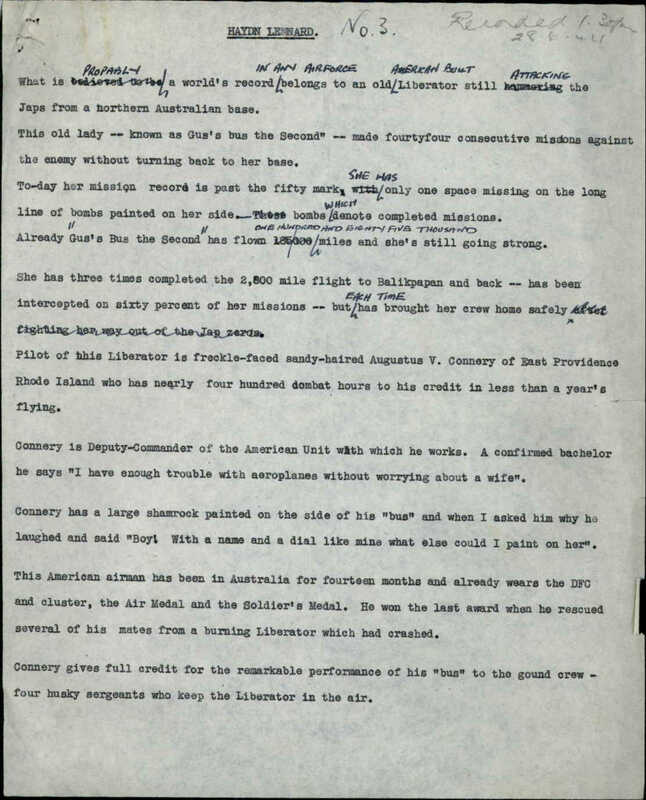 It also included another letter to Arthur's wife from F/o Harold Freckelton, dated 18th Oct 1944 just 1 month after the accident, Harold was also in the group of Spitfires doing practice att acks on 380th BG B-24s and had seen the accident happen. Colonel Forrest Lee Brissey died about 40 days ago. Washington this afternoon. He, like all of you who served in the 380th, were great Americans. I shall salute him from all of you! Thanks for your thoughts on my father's passing, Barbara. We will see if we can come the reunion in New Orleans this Fall. I am conducting official research into a variety of US air force units based in Australia during WWII to confirm base locations and activities conducted. Much of the prior research I have reviewed has focussed on 'operational' activities (i.e. bombing missions, etc. ); however, there appears to very little information related to what the units did at their bases and the training they conducted in Australia. If you have information related to the above, I'd be very grateful if you could let me know or send copies of information. Did a search on Ebay for the 380th, no leather jackets this time but a batch of original photos were up for auction. Again if you know of any books that have become available, please pass on the info. I am not sure how active the 380th association still is but my father-in-law, Cecil Edgar Parsons, an Australian pilot with your group is still going strong and still flying his own plane. He also flew in the RAF in bomber command earlier in the war. I came across this photo on the internet. 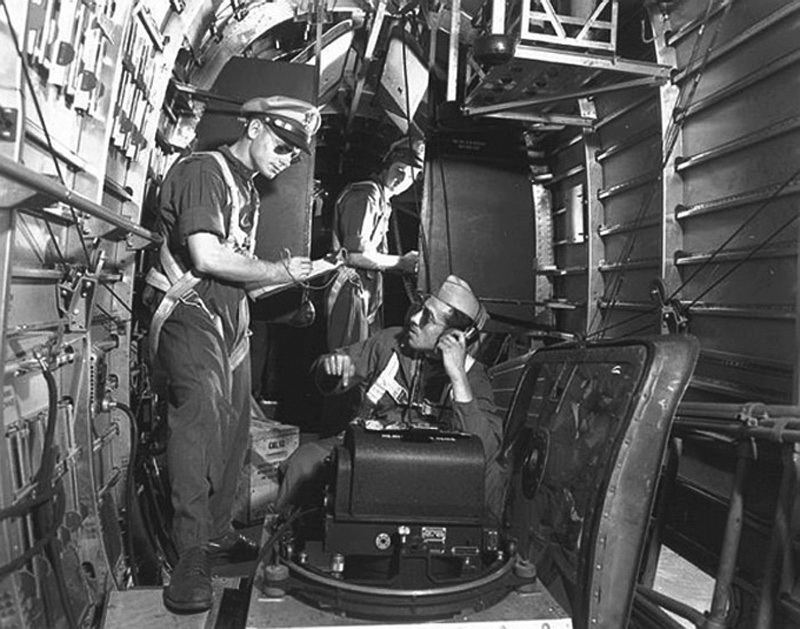 It shows a B-24 interior, rear part of the fuselage, at the bottom hatch, with an aerial camera mounted in the open hatch (view is looking forward, from the tail toward the front). Guess this was the way a lot of aerial strike photos were taken. The guy in the background, in the partition "doorway," is one of the waist gunners at his gun. 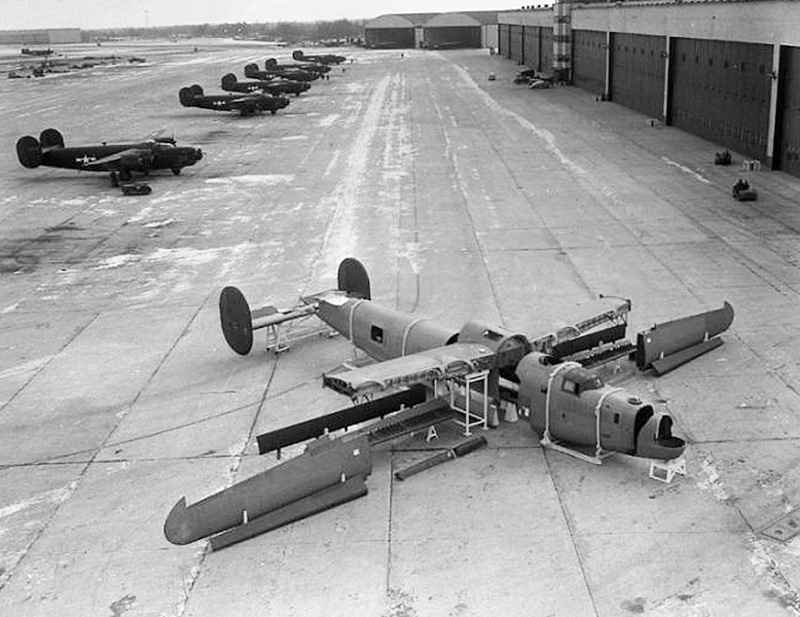 I also found the photo of a B-24 outside a manufacturing facility, showing how it was put together in sections. My maternal grandfather, Bernard Shashaguay, died a week ago. Upon his death, my mother (Sally) and some of her siblings discovered some papers and books that have raised questions about his military service. The family had known that my grandfather served in the army in Asia during WWII, but he had never talked about his service and no one had any reason to believe that his service involved anything of note. His discharge papers, however, reveal that he received some awards as a Technical Sergeant for the 531st Squadron of the 380th Bomb Group from 1942 to 1945. We were very surprised by this information. This information led us to your website, 380th.org, where my grandfather is included on your roster. The information we have has prompted more questions than we'll ever get answered. But I write in hopes that, given your work with the 380th, you might be able to shed some light on a few things. Your website lists my grandfather as "Ground Staff , Engineering, Technical Supply, Quartermaster Supply Technician; Administrative NCO." What does all of this mean? What did my grandfather actually do? I know you may not be able to answer specifically, but I'm hoping for general information about what someone with his title would have done for the 531st. His discharge papers list all of the places he served. I can share this information if it would be helpful in answering these questions. Finally, based on your website, it appears that you hold reunions and provide a way for members of the 380th to stay connected. Would it be possible for you to make some sort of announcement (by email, in your newsletter, or some other way) that the family of Bernie Shashaguay is looking to be in touch with anyone who might have served with him? Any chance to get a first hand account, or possibly copies of photos, from someone who served with my grandfather would be very special. Many thanks for any assistance you are able to provide. My name is Bill Shek. I am an associate member of the 380th Bomb Group Association and just read your letter in the 380th BG Newsletter. My father was a B-24 pilot in the 380th BG, 528th Squadron the same time your grandfather was stationed there with the 531st. It looks as if your grandfather was assigned to the Supply section of the squadron, at least for part of his tour. "Ground Staff" means he was not an aircrew member, but worked in support of the aircraft. "Engineering" and "Technical Supply" would mean he probably had something to do with structural or possibly electrical parts for the B-24s. "Quartermaster Supply Technician" meant he worked for the head of the Supply section, who was called the "Quartermaster." "Administrative NCO" means he was also assigned to the Administrative section (probably of the Supply section or the Squadron), in charge of the record-keeping, filing, correspondence, etc. As for the battle stars: Being in the Pacific Theater during WW2, he would have received a medal called the "Asia-Pacific Campaign Medal". I've attached a photo of it and its associated ribbon (the ribbon would have been worn on the dress uniform in place of the actual medal). On that ribbon would be placed a small bronze star, called a "battle" or "campaign" star, which represented a single battle campaign he was involved in. Up to 4 of these bronze battle stars (one for each separate campaign) would be put on the ribbon. When the 5th campaign was reached, the bronze stars were replaced by a single silver battle star (which represented 5 campaigns). So, if he had 2 bronze and one silver, that means he was in 7 campaigns. Don't confuse these bronze/silver "battle stars" with the Bronze Star and Silver Star Medals--those were separate full medals awarded for bravery in battle. So, the battle stars you are referring to that your grandfather was awarded were the small stars that went on the ribbon. Without his records it will be difficult to pin down the exact campaigns or why he received other awards. I'd recommend that your Mother submit the request, or you submit it in her name, since she is his daughter and direct next of kin. For his awards, request copies of his Award Citations (I did this for my father's awards and received the info I wanted). The citation records will have information about the awards and why they were given to him. You will need to supply certain info about him, which is listed on the website. There was a huge fire in the records archives in St. Louis in the 70s and many WW2 vet records were destroyed. However, since then progress has been made on restoring some of them. So, if you get a reply that his records aren't available because of the fire, don't give up. Keep submitting the request-sometimes you may get a clerk who is too lazy to look very far for the records, then later someone else finds them for you in another request. I hope this information helps a little. I know how frustrating it is to try and piece together a relative's WW2 history after he is gone. Good luck with your searches. So many "thank you's" to go around. Barbara, thanks for circulating my inquiry about my grandfather. Bill, many many thanks for taking the time to provide this information and the photographs. You indeed shed some light on my grandfather's life during the war. You confirmed what little we knew, and provided important context to help explain a lot that we didn't know (and/or that didn't make sense). I know my mom, her 5 siblings, and my grandparent's numerous grandchildren, greatly appreciate what you have provided. I plan to review this information more closely. If you don't mind, I may email you with other questions.